SpaceX is set to resume launches from pad 40 at Cape Canaveral in December with the liftoff of a space station-bound supply ship on top of a Falcon 9 booster, a major step in boosting the company’s flight rate and readying for the debut of the long-delayed Falcon Heavy rocket. The flight will blast off no earlier than Dec. 4 at about 2:52 p.m. EST (1952 GMT), roughly the moment the International Space Station’s orbital pathway lines up with the launch trajectory heading northeast from Cape Canaveral. The exact timing of the launch, assuming it remains scheduled for Dec. 4, could be adjusted by a few minutes as engineers track changes in the space station’s orbit in the coming weeks. 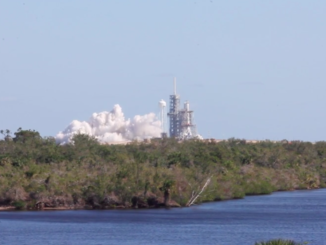 SpaceX has launched all its Florida-based missions this year from pad 39A, a former Apollo and space shuttle launch complex the company leased from NASA. 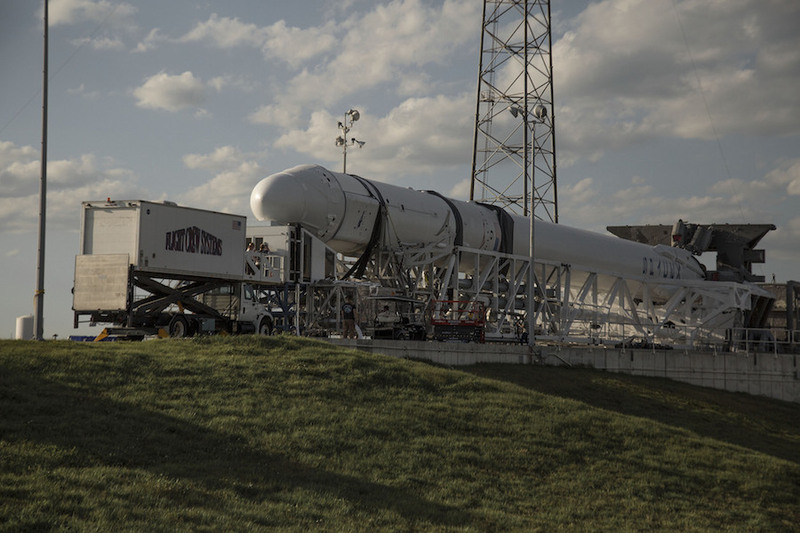 The Falcon 9’s previous launch pad, located a few miles to the south at neighboring Cape Canaveral Air Force Station, was significantly damaged when a rocket exploded there Sept. 1, 2016, during fueling before a customary pre-flight hold-down engine firing. Investigators determined the most likely cause of the explosion was the rupture of a high-pressure helium reservoir inside the Falcon 9’s upper stage liquid oxygen tank. 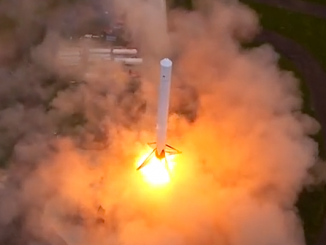 SpaceX changed the way it loads helium and oxygen into the rocket, and later redesigned the Falcon 9’s helium tanks themselves, to avoid the problem on subsequent missions. But pad 40 was not repaired by the time SpaceX cleared launches to resume earlier this year, and crews finished readying pad 39A in time to begin supporting launch operations in February. Twelve Falcon 9 flights have lifted off from pad 39A since then, and one more is on the docket before pad 40 is back online. A Falcon 9 rocket is slated to launch from pad 39A no earlier than Nov. 15 with a mysterious U.S. government payload named Zuma. The following mission on SpaceX’s manifest, a Dragon cargo delivery mission to the space station, will mark the changeover to pad 40. The unpiloted Dragon capsule will haul several tons of experiments and provisions to the space station’s six-person crew, along with a NASA-sponsored instrument built to monitor how much solar radiation is being absorbed by Earth, a key measurement needed by climate scientists. The solar irradiance sensor will be mounted outside the space station for at least five years of observations. 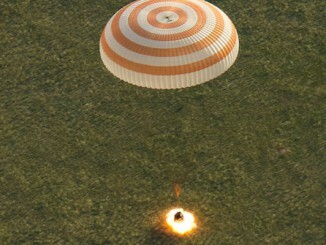 NASA said the Dragon spaceship assigned to the December launch is the same capsule that flew to the station in April 2015 and returned to Earth a month later. SpaceX launched a reused Dragon cargo craft to the space station for the first time in June, and the last newly-manufactured first-generation Dragon was launched in August. All future SpaceX resupply flights will use refurbished Dragon capsules until upgraded ships are ready to take over. NASA and SpaceX have not confirmed whether the Dec. 4 launch will use a recovered Falcon 9 first stage, or a new one. While some reports suggest the space agency has approved future cargo launches to use previously-flown rocket boosters, a NASA spokesperson said Monday that officials have not finalized the decision. The California-based rocket-builder has at least three more missions scheduled before the end of the year — two Falcon 9s from Florida and one from Vandenberg Air Force Base in California. The switch to pad 40 will clear pad 39A for final upgrades to prepare for the inaugural test launch of SpaceX’s Falcon Heavy, which will become the most powerful rocket in the world when it flies. Three modified Falcon 9 first stage boosters will power the Falcon Heavy, with 27 main engines delivering more than 5 million pounds of thrust at liftoff. The Falcon Heavy is needed to loft the heaviest commercial and U.S. military satellites that are outside the Falcon 9’s performance reach. Once workers finish upgrading pad 39A’s transporter-erector for the bigger Falcon Heavy, SpaceX will mount the triple-core rocket for rollout to the pad for a fueling test. Then the heavy-lifter will be test-fired to demonstrate how all 27 main engines will perform in unison. SpaceX has not yet test-fired all 27 engines together because its test stand in Central Texas is not equipped for a full-up static fire. The company says the Falcon Heavy could be ready to lift off for the first time by the end of the year, but that schedule assumes the ground tests go smoothly. The earliest the Falcon Heavy might launch is late December, but SpaceX has not set an official target date. All three first stage cores for the Falcon Heavy are at the Florida spaceport for final processing. The side boosters were previously flown on Falcon 9 launches, and the center core is fresh from SpaceX’s factory in Hawthorne, California.